[PDF] Color Ordered: A Survey of Color Systems from Antiquity to the Present | Free eBooks Download - EBOOKEE! Description: Since antiquity, people have searched for a way to understand the colors we see what they are, how many there are, and how they can be systematically identified and arranged in some kind of order. How to order colors is not merely a philosophical question, it also has many practical applications in art, design, and commerce. Our intense interest in color and its myriad practical applications have led people throughout history to develop many systems to characterize and order it. The number of color order systems developed throughout history is unknown but ranges in the hundreds. Many are no longer used, but continue to be of historical interest. Despite wrong turns and slow progress, our understanding of color and its order has improved steadily. Although full understanding continues to elude us, it seems clear that it will ultimately come from research in neurobiology, perception and consciousness. Color Ordered is a comprehensive, in-depth compendium of over 170 systems, dating from antiquity to the present. In it, Rolf Kuehni and Andreas Schwarz present a history and categorization of color systems, describe each one using original figures and schematic drawings, and provide a broad review of the underlying theory. Included are a brief overview of color vision and a synthesis of the various systems. This volume is a unique and valuable resource for researchers in color vision, and visual perception, as well as for neuroscientists, art historians, artists, and designers. 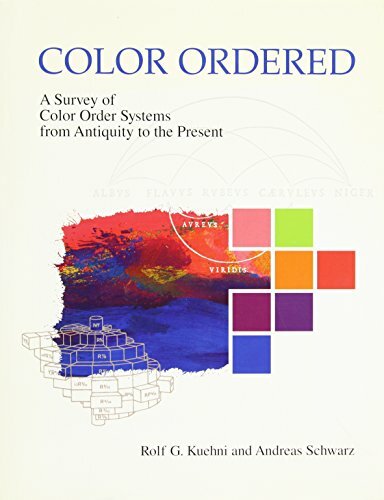 2012-05-14Rolf G. Kuehni, "Color Space and Its Divisions: Color Order from Antiquity to the Present"
No comments for "[PDF] Color Ordered: A Survey of Color Systems from Antiquity to the Present".